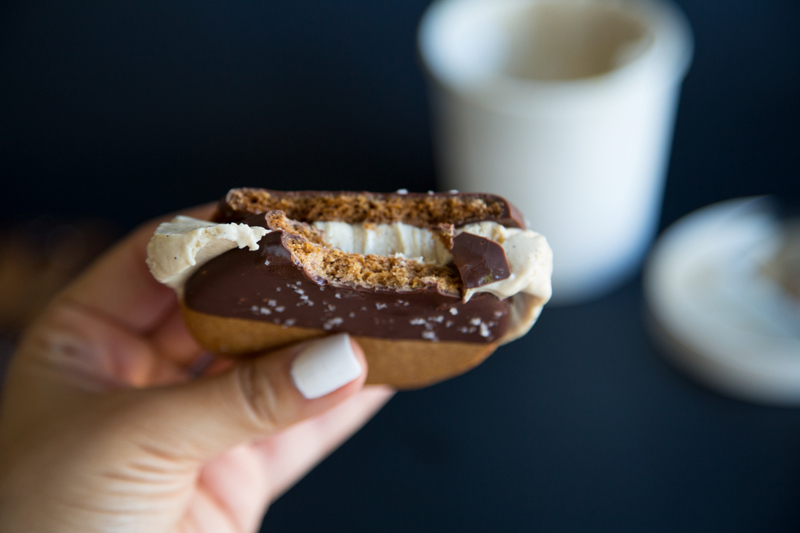 From the kitchen: S’mores Ice Cream Sandwiches! Line a baking sheet with parchment paper. Spread the marshmallows out in one even layer. Use a brulee torch to toast the marshmallows. If you don’t have a torch, use your broiler to brown the marshmallows, but be sure to keep an eye on them or else they’ll burn! Toast to a deep brown. Flip marshmallows using a spatula and repeat the process to toast evenly. Set into a blender and let cool. Place the egg yolks, sugar and salt in a large mixing bowl. Whisk until the mixture turns a pale yellow color, about 3 minutes. Place the cream, vanilla bean and scraped seeds in a medium saucepan. Heat the mixture over medium heat, stirring often, until it is steaming but not quite simmering. Don’t let this mixture boil! Spoon out about 1/4 cup of the hot cream and slowly stream it into the egg yolk mixture, whisking constantly to temper the eggs. Repeat once more to further temper. Pour the tempered egg mixture into the saucepan with the hot cream and heat, stirring until the mixture coats the back of a wooden spoon. Remove mixture from the heat. Pour mixture over the marshmallows in the blender. Blend for 60 seconds. Add the cold milk and vanilla extract to the blender and blend for 30 more seconds. Let mixture cool to room temp with the lid off (about 30 minutes), then replace lid and place in the fridge for 3-6 hours. You want this mixture to be as cold as possible before going to the ice cream machine. Churn the ice cream according to manufactures instructions. Transfer ice cream to a sealable container, cover, and place in freezer until firm, at least 2 hours. Brown butter in a small sauce pan. Let the butter melt over a medium flame and stir occasionally until a nutty aroma releases and you can see small brown bits at the bottom of the pan. remove immediately and transfer butter to a heat safe container. Brown butter turns to burnt butter really fast so make sure you remove it from the heat as asap. Combine the flour, brown sugar, baking soda, and salt in the bowl of a food processor fitted with the steel blade or in the bowl of an electric mixer fitted with the paddle attachment. Pulse or mix on low to incorporate. Add the butter and pulse on and off on and off, or mix on low, until the mixture is the consistency of a coarse meal. Alternately, if you don’t have a food processor or electric mixer, you can cut the ingredients together with a pastry blender. Just make sure they’re very well incorporated. In a small bowl, whisk together the honey, milk, and vanilla extract. Add to the flour mixture and pulse on and off a few times or mix on low until the dough barely comes together. It will be very soft and sticky. Lay out a large piece of plastic wrap and dust it lightly with flour, then turn the dough out onto it and pat it into a rectangle about 1-inch thick. Wrap it, then chill it until firm, about 2 hours or overnight. 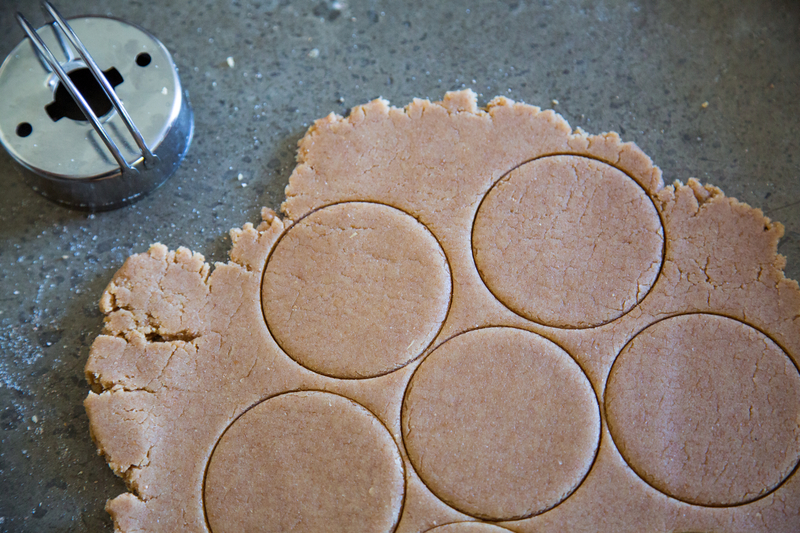 On a lightly floured surface, roll out the dough to a 1/8-inch thickness and cut using a 2″-3″ cookie cutter. I used a round one, as you can see. Transfer to the baking sheet, spacing the crackers at least ¾-inch apart, gather any scraps, re-roll, and cut out more cookies. Place chocolate in a double boiler to melt over medium heat. Once melted, dip half of each cookie and shake a bit to remove excess chocolate. Place on a parchment lined baking sheet and sprinkle with sea salt, refrigerate for 1 hour. 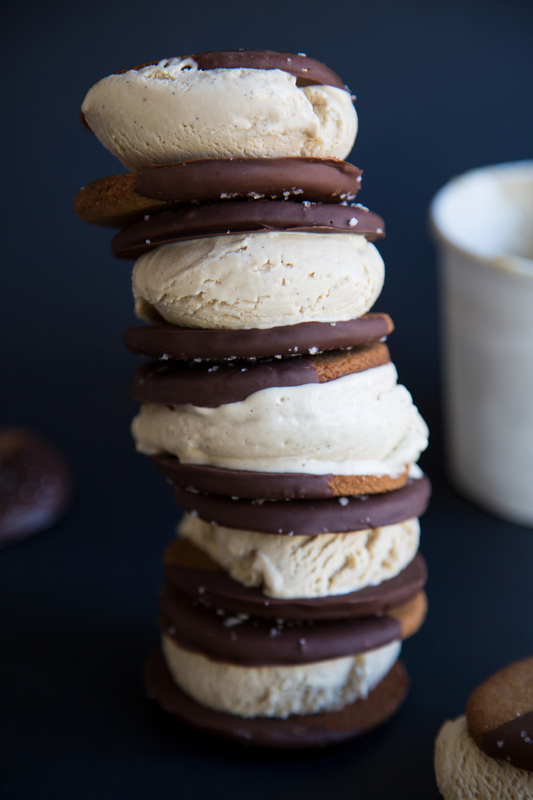 Add one scoop ice cream to one cookie and top with another. Wrap in parchment and place in the freezer to firm up. Keep frozen until ready to serve. Dig in and experience the goodness! ← Guest Post: Honestly YUM! Audrey Wolf Good looking, Popular, Generally amazing. 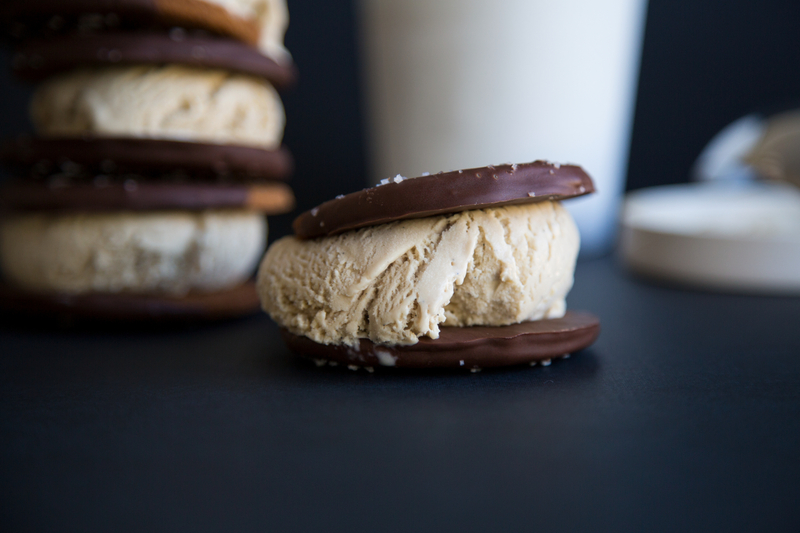 Homemade ice cream sandwiches are the best! Thanks for posting this recipe. Reminds me of doing this as a kid on summer vacation. Beautiful photos! Yum yum yum. Ohmygosh I think I put on weight just looking at these pictures! They look amazing! I want to eat six of those! Yum! Oh wow. I may have to try making a dairy-free grain-free version. LOOKS SO GOOD! Absolutely delicious! Perfect for those hot days (at least for Italy, where I live). And congratulations for the beautiful pictures! Everything perfect! Thank you for this sweet tooth! I love it when that happens. 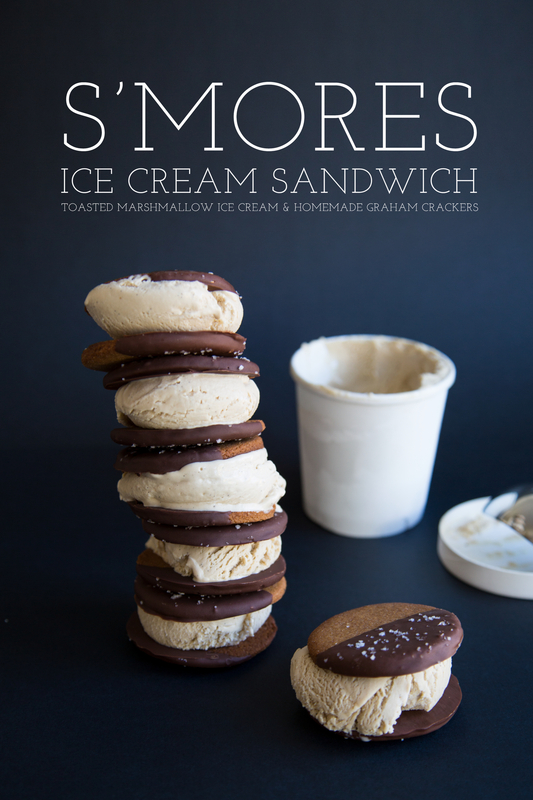 I already posted this on my friend’s Facebook wall and told her if she makes the ice cream, I’ll make the crackers and it’ll be the best thing that ever happened to us. That looks PERFECT. All I can say is….MAKING! What a wonderful idea! Yummmm! These are so lovely I almost wouldn’t want to eat them. Except they also sound outrageously delicious. Must try. Now I need an ice cream maker. This looks amazing! Wow, good thinking. These look super delicious! Will add them to the must make list. Ha!!! I’m sorry… and you’re welcome!! RedRiot is a rockin' Halifax-based PR + Marketing firm | We build awesome brands. We love big ideas, guerrilla marketing, writing, design and silliness.